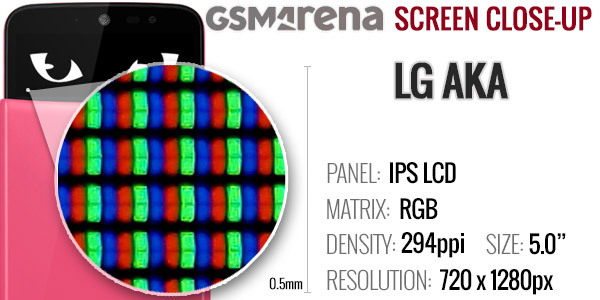 The LG AKA is built around a 5.0" display. It's an IPS LCD unit of reasonable quality. The resolution is good for the class at 720p resulting into a very comfortable 294ppi. Blacks are deep at both ends of our test, 50% and 100% brightness. Speaking of, it's a sufficiently bright screen and its contrast ratio is impressive. Sunlight legibility is quite good, though not the best. The screen performs decently under direct sunlight but it would've done better had it been a little less reflective. The LG Aka has a relatively beefy 2,610mAh battery. Some local versions, such as the Hong Kong version we are reviewing (H788N), have a slightly smaller, 2540mAh battery. 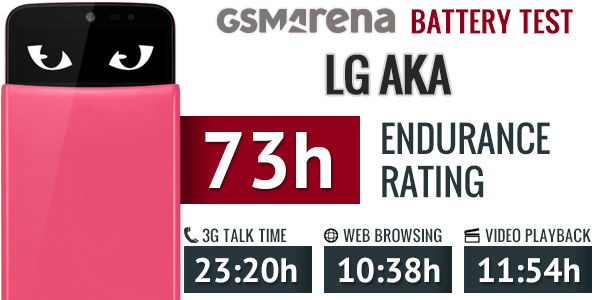 Despite that supposed handicap, our LG AKA scored an excellent overall rating of 73 hours in our test, which means you can count on three full days if you do an hour each of calling, web browsing and video playback daily. 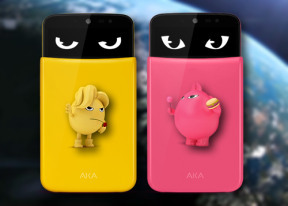 The AKA did great at 3G calls, web browsing and video playback, but failed to impress when it comes to standby. It managed about 200 hours - an only average score. While our endurance rating is not necessarily the battery endurance you are likely to get with your own usage on your own mobile network, it's mainly a good way of comparing battery life across the phones we review. The LG AKA comes with quad-band 2G/GPRS/EDGE support, quad-band 3G with HSDPA and HSUPA, as well as quad-band LTE support with band 1(2100), 3(1800), 7(2600), 20(800) support. The AKA has Wi-Fi with Direct functionality but it doesn't support the 5GHz band, so you'd have to rely on the more common but more congested 2.4GHz band. Bluetooth 4.0 is also on board with A2DP support. The microUSB 2.0 port does not support USB on-the-go. GPS support is available, but not the GLONASS variety. There's also FM Radio and NFC but no IR port and no way to get wired TV Out functionality either.